Women's studies (also called feminist studies) are an academic field that explores politics, society, media and history according to women's views. The first accredited Women's Studies course was in 1969 at Cornell University. 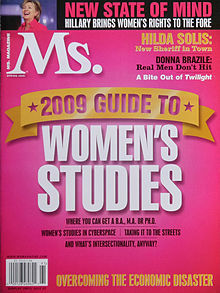 Women's studies are available at many colleges and universities. ↑ "Women's Studies". The Artemis Guide. Retrieved June 21, 2014. This page was last changed on 12 March 2016, at 21:03.